This weekend we did our first official 'trip' to another town. We (myself, TJ and Jonas a good friend) drove on the Autobahn to Heidelberg. Although we haven't been here for long, I don't think the Autobahn is as crazy as people make it out to be. There are places that have no speed limits, and I am sure that once you get outside of the cities this occurs more frequently. Generally, though, there is a posted speed limit and it ranges between 55-80mph. But who knows, maybe I'm speaking too soon. Anyway, we get to Heidelberg and it is beautiful. It looks just like the image many people have when they think of Germany. 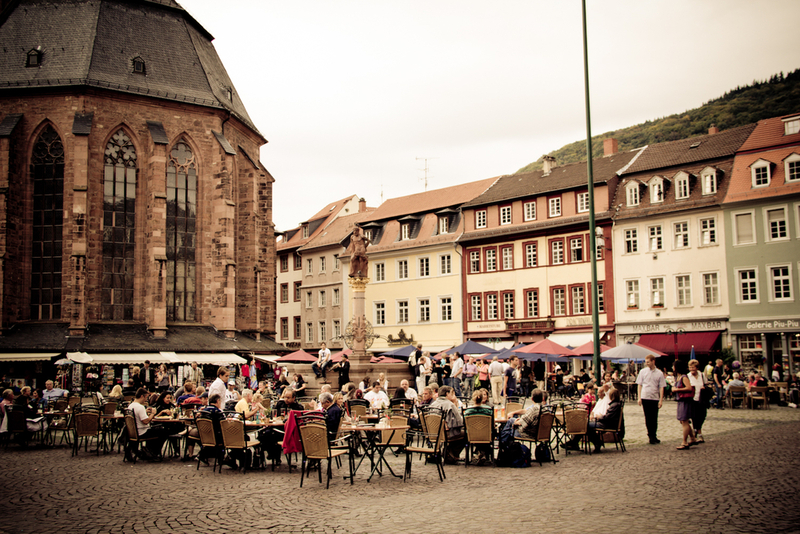 Cobblestone streets, old churches, a castle perched on the top of a hill, and the Neckar river to complete the town running alongside it. Since we were only there for a day, we didn't get to see everything the town has to offer. But, we did manage to make it up the steep cobblestone steps to the castle and walk around for a while. The view from the top of the castle was quite amazing. When we got in, we walked around for a bit, had a few hefeweizens, and decided to go on a tour. Well, the tour was very disappointing. So much so that we left about half way through it! The lady was jumping back and forth between centuries, and overall she seemed very nervous the entire time. The next day we decided it would be a great idea to try the Hard Rock Cafe. I know, I know, we have all these amazing options for food, but we haven't had a burger in a few weeks and we were craving one. Plus, we've been eating schnitzel and pork in every variety for the past few weeks. So TJ ends up ordering a Queen burger, I decide to get an appetizer platter consisting of basically all grease (it seemed like a good idea at the time), and Jonas gets a pizza. Well, TJ asked if he could get his burger medium rare and the waitress didn't quite understand what he wanted. When the burger arrived, it had clearly just been a frozen patty a few minutes ago. And the medium rare ended up being a partially frozen patty in the middle! Needless to say, TJ wasn't too thrilled with the burger. I could barely stomache mine, but Jonas ended up lucking out with his pizza. Afterwards, we walked along the river, then headed back to Boblingen. Overall it was a great weekend. 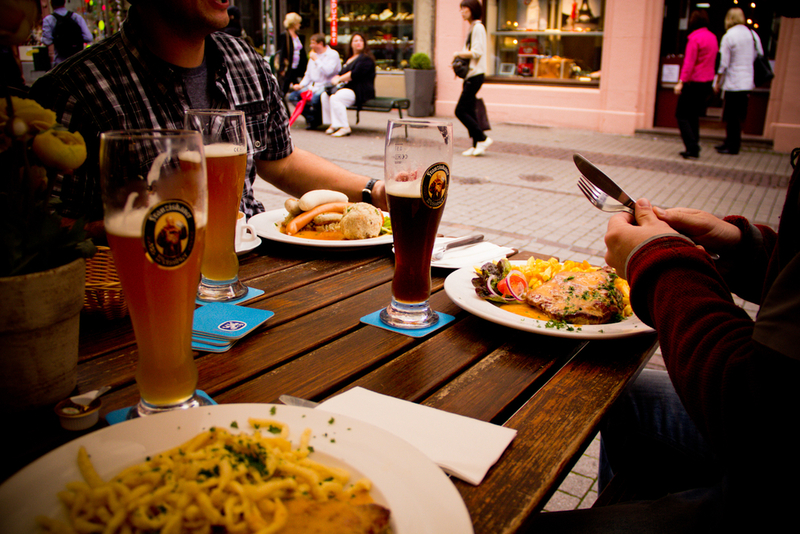 Traditional German Food with Traditional German Beer. Need I say more?